What is Target Beauty Box? 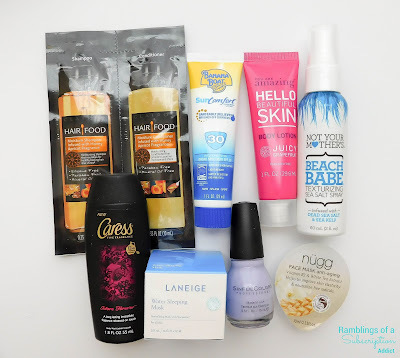 : Target releases a Beauty Box every so often. It has now become a sporadic event, so make sure you subscribe to my email updates to know when the next one comes out! The boxes can be seen prior to purchase, and they are curated 100% with products sold at Target, so you can get the products you love. 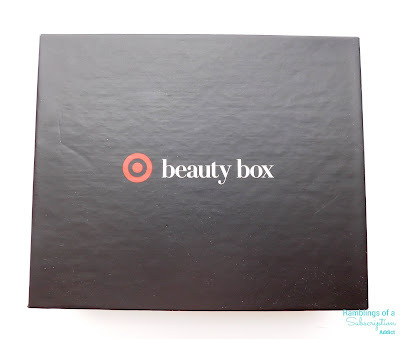 How Much is Target Beauty Box? : The price has been anywhere from $5-$10, but you get free shipping with your Beauty Box purchase. You will have to pay taxes if there is a Target in your state, though. Every box comes with a coupon for a Target purchase, which definitely makes it worth the money! This box was $5 plus tax. Check out what has been in past Target Boxes here! This box sold out quite quickly, but don't fear - I have purchased an extra of this most recent one and will be giving it away! 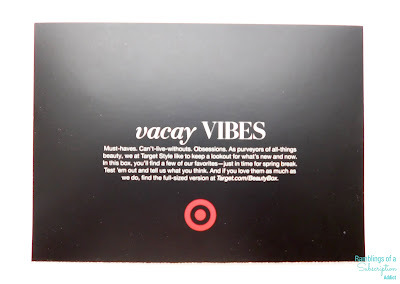 The box from March was about Vacations and what you will need to get ready for a vacations! 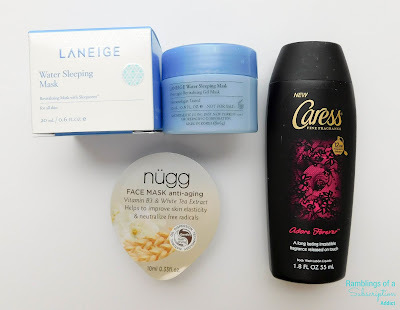 Laneige Water Sleeping Mask ($6.86) - This has such a strong scent to it, it was very hard to get used to at first. I had not heard of a sleeping mask before, and I'm still not sure how well it works. I haven't felt a difference, but it I would definitely appreciate a much lighter scent if I purchased a full-size. nugg Anti-Aging Face Mask ($3.29) - I definitely really like this mask. It's not super strong and it feels nice both on and once you take it off. Caress Body Wash (Adore Forever) ($0.53) - I can't really put my finger on what this scent is. It is very floral, that's for sure, but I can't figure it out beyond. It's not super strong and I really like it. Not Your Mother's Beach Babe Texturizing Spray ($1.20) - If I had received this any earlier, it would have been useless. 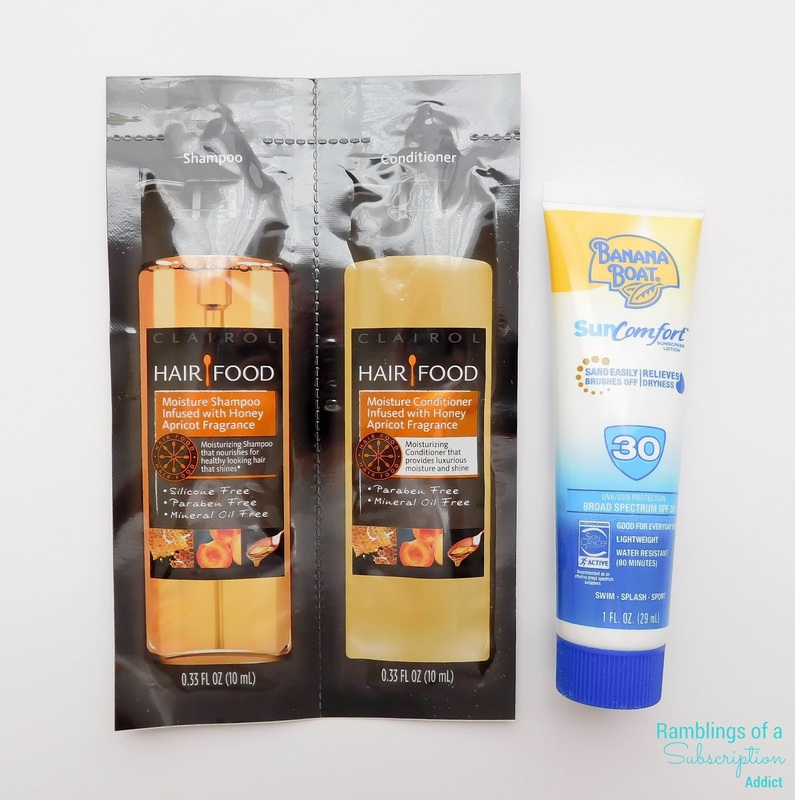 Now that I've cut my hair much shorter, I'm thrilled to be able to texturize my hair! I love this scent and need a huge bottle because it's perfect for spring/summer! you are AMAZING Body Lotion (Juicy Grapefruit) ($0.50) - I'm not sure about if I really needed another lotion, but this one smells so fruity and the formula isn't too light or heavy. It's the perfect lotion. Sinful Colors (Lie-Lac) ($2.02) - I could not find this polish on Target's website, so I'm not sure how it's picked to see which color is sent in the boxes. This is a great springy color, so that's always nice. Clairol Hair Food Shampoo/Conditioner ($0.29) - I am so tired of foil packs for shampoo/conditioner, it's just boring and you don't get any use out of it. I have been saving them for when we go out of time so I don't have to worry about bringing full bottles. Banana Boat Sunscreen ($0.81) - Sunscreen is something that I have actually been finding a use with recently. I have been spending more time outside and therefore, I need to be wearing more sunscreen. This is perfect for throwing on my arms and face, and be ready to go! I don't remember what the value was promoted as, but I figured up that the box is actually worth $18.50. That's a really good deal for what I paid ($5 + tax) and I tried out a good number of products and found a few that I really love.